Hubby and I are back on track with meal planning. Basically, on Sunday we plan our meals for the week and buy all the groceries needed for those meals. It makes the week nights so much less stressful. Plus since there are only two of us, cooking one night usually provides leftovers for the next day either for lunch or dinner. I wanted something easy for tonight’s dinner and I had a star on this recipe for quite a while. It was very easy to throw together. I served it with some veggies and roasted potatoes (the Green Giant frozen kind – yum!) 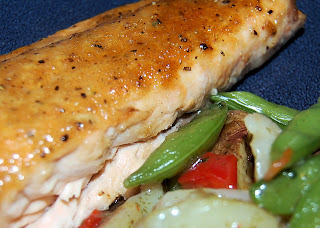 We both loved this salmon and agreed to make it any time we need something quick to throw together. 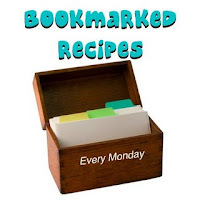 I’m submitting these to the weekly blogging event: Bookmarked Recipes. Pat the salmon fillets dry. Brush with melted butter. Combine the seasonings in a small bowl and mix. Sprinkle the seasonings over the salmon, and press down gently. On a lightly greased baking sheet (I forgot to grease mine at all), bake for 20-25 minutes. Line the sheet with foil for easy cleanup.